Temperatures are starting to cool down, and with that many of us will be turning to lotions to make sure our skin stays moisturized in the cool, dry air. 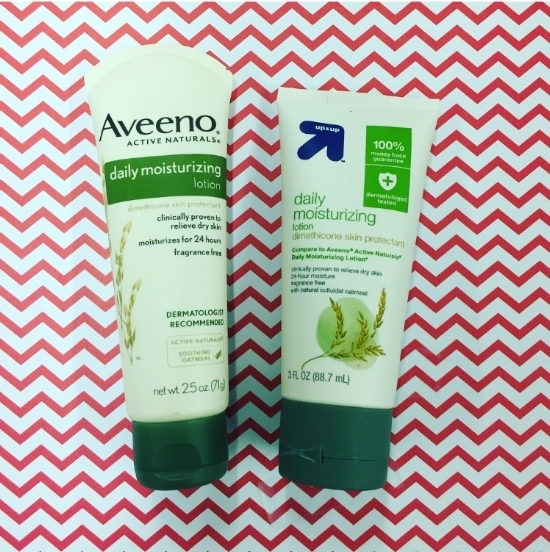 Brandefy-er Alexandra M. submitted a request that we compare Target’s up&up daily moisturizing lotion to the Aveeno version, so we picked them up and put them to the test. The first thing we noticed was that the ingredient panels matched exactly, both active and inactive. This is always a good sign, as it means only the proportions of the inactives can be different. Overlapping ingredients are highlighted in green on the chart below. Both products were advertised as fragrance free, and both lived up to the billing. Both products were almost completely odorless. The products did differ slightly in consistency. Aveeno’s lotion was more of an off-white, while up&up was a pure white. Where our testers knocked points off from the Up&Up version was the consistency. Up&Up’s lotion was thinner and more watery, while the Aveeno had a thicker, more solid consistency that our consumers preferred. Once the lotion was applied, our testers were pleased with the results from both. Both left the skin feeling moisturized, without minimal residue or stickiness. Overall, this product scored quite highly, with a similarity score of 85.2%. Almost all of that difference was accounted for in the difference in consistency between the products. In addition, Up&Up offers its 100% money back guarantee for the product, which is advertised directly on the front of the packaging. This product stands on its own merits, but the money-back guarantee means there is almost no risk to giving it a try.